Wild Things Dog Training provides the highest quality dog training that St. Charles and Chicago’s Northern West Suburbs have to offer. Our dog trainers pride themselves in being skilled in Operant and Classical Conditioning, Clicker Training, and Positive Reinforcement Training. This means that our dog training is not “one size fits all”, our training techniques are tailored to each unique animal and family in order to produce the best results. We believe that dog training is not about punishing your dog for bad behavior; it’s about replacing unwanted behavior with positive behavior. By effectively teaching your dog what is expected, we help you establish rules and guidelines for the dog to live by. When you are in charge, we can teach the dog what type of behavior is allowed and what is not. Whether you just welcomed a new puppy into your home or are struggling with the behavior of a mature dog, we will help you build a balanced and happy relationship with your best friend. Our dog training is done on a personalized, individual basis with the owner, as this has proven to be the most effective way to teach your dog. Individual time with a professional trainer gives you the opportunity to ask questions, try techniques on your own, and help us address any unique needs of your canine. Because your dog is the only one in the room, you will get direct and specific feedback on what works best for both of you. By the end of the program, you will learn how to implement and maintain the training with minimal effort so the training becomes part of your dog’s everyday behavior. The foundation of dog training is a learned respect and understanding between a dog and each of its handlers. Dog training is useless if your dog listens to the trainer but ignores you. Therefore, owner instruction is an integral component of these training programs, ensuring that the training is still effective even when your trainer is not around. Tim is an AMAZING, enthusiastic and knowledgeable trainer. 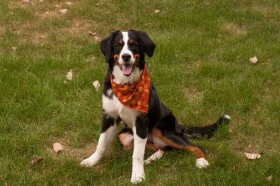 He has taught my 4 month Bernese Mountain puppy a new great behavior everyday! She is well on her way to being a great canine companion!!! Call this company! They are wonderful, hard working and always there for their customers!! !